A large number of studies and reports have confirmed that higher education in the Gulf Cooperation Council (GCC) region (Saudi Arabia, Kuwait, Qatar, Bahrain, United Arab Emirates and Oman) has fallen short of expectations and has failed to address the aspirations of younger generations. The same is in fact true for the entire MENA region (Middle East and North Africa). As such, education, which has traditionally been a public function, has been the target of an ongoing privatization drive with the aim of opening up the sector to new ideas, practices and competition. It is hoped that through privatization and cross-border partnerships, regional colleges and universities can better learn from leading global actors in this area and can localize some of the best practices in teaching and research. Alissa, S. (2007). Strengthening the Private Sector is a Prerequisite for Dealing with Unemployment in the Arab World, Dar Al-Hayat, March 7. Retrieved from the Carnegie Endowment web site: http://www.carnegieendowment.org/ publications/index.cfm?fa=view&id=19056, accessed on November 6, 2012. Altbach, P. G. (2010). “Global: Why Branch Campuses may be Unsustainable”, University World News, February 28. http://www.universityworldnews.com/ article.php?story=20100226130619281, accessed on November 6, 2012. American University of Kuwait. About AUK: AUK & Dartmouth, http://www.auk.edu.kw/about_auk/auk_dartmouth.jsp, accessed on November 6, 2012. American University of the Middle East. Admission. Retrieved from http://www.aum.edu.kw/, accessed on November 6, 2012. Atkins, M. (2012). “The GCC’s Top MBA Courses”, Gulf Business, http://gulfbusiness.com/2012/04/the-gccs-top-mba-courses/#.UBUtXmHinZc, accessed on November 6, 2012. Human Rights Watch (2011). “Bahrain: Reinstate Ousted Students, Faculty: Hundreds Dismissed for Peaceful Dissent”, September 24. http://www.hrw.org/news/2011/09/24/bahrain-reinstate-ousted-students-faculty accessed on November 6, 2012. Barber, M., Mourshed, M. and Whelan, F. (2007). “Improving Education in the Gulf”, The McKinsey Quarterly, www.mckinseyquarterly.com/Improving_ education_in_the_Gulf_1946, accessed on November 6, 2012. Burns, R. (2010). “UAE Development Attracts Foreign B-Schools”. http://www.topmba.com/articles/asia/business-school-MBA-UAE, accessed on November 6, 2012. CIA World Factbook (2012). https://www.da.gov/library/publications/the-world~ factbook/, accessed on November 6, 2012. Coclanis, P. A. and Strauss, R. P. (2010). “Partnerships: An Alternative to Branch Campuses Overseas”, The Chronicle of Higher Education, September 2. http://chronicle.com/article/Partnerships-a-Different/124286/, accessed on November 6, 2012. De Boer, K. and Turner, J. M. (2007). “Beyond Oil: Reappraising the Gulf States”, The McKinsey Quarterly. http://www.mckinseyquarterly.com/Economic_Studies/ Country_Reports/Beyond_oil_Reappraising_the_Gulf_States_1902, accessed on November 6, 2012. Deghady S. (2008). “Higher Education Sector Sees Major Expansion in the Gulf”, Gulf Times, May 29. Retrieved from http://www.gulftimes.com, accessed on May 29, 2008. Deparle, J. (2007). “Rising Breed of Migrant: Skilled and Welcome”, The New York Times, August 20. http://www.nytimes.com/2007/08/20/world/middleeast/ 20migrate.html?_r=2&pagewanted=2&fta=y, accessed on November 6, 2012. Edelstein, R.J. and Douglass, J. A. (2012). “ToJudge International Branch Campuses, We Need to Know Their Goals”, The Chronicle of Higher Education, February 27. http://chronicle.com/article/To-Judge-International-Branch/130952/, accessed on November 6, 2012. Eisenhood, C. (2011). “UAE Detains a Prominent Professor, Raising Questions of Academic Freedom at NYUAD”, NYULOCAL, April 12. http://nyulocal.com/on-campus/2011/04/12/uae-detains-prominent-professor-raising-questions-about-academic-freedom-at-nyuad/, accessed on November 6, 2012. Epstein, D. (2009). “Gulf Withdrawal”, Inside Higher ED, February 27. Retrieved from http://www.insidehighered.com/news/2009/02/27/mason, accessed on November 6, 2012. Executive (2012). 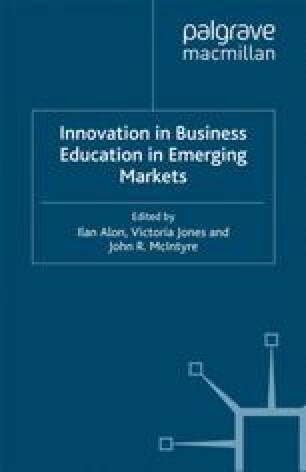 “Executive Education—Learning Business in the Middle East”. Retrieved from http://www.executive-magazine.com/special-report/ executive-education—learning-business-in-the-middle-east/856/0, accessed on November 6, 2012. Fardeau, J. (2011). “A Professor on Trial in Abu Dhabi: The Sorbonne’s Complicity of Silence”, Human Rights Watch, October 4. http://www.hrw.org/news/2011/10/04/pr of essor-trial-abu-dhabi-sorbonne-s-complicity-silence, accessed on November 6, 2012. Fischer, K. (2012a). “Accreditors Caution American Colleges as They Create Academic Programs Abroad”, The Chronicle of Higher Education, February 22. http://chronicle.com/article/Accreditors-Caution-American/130888/, accessed on November 6, 2012. Fischer, K. (2012b). “American Colleges’ Missteps Raise Questions about Overseas Partnerships”, The Chronicle of Higher Education, February 19. http://chronicle.com/ arude/mvesugations-Raise-Qu estions/130861/, accessed on November 6, 2012. Ghabra, S. and Arnold, M. (2007). Studying the American Way: An Assessment of American-Style Higher Education in Arab Countries. The Washington Institute for Near East Policy (Policy Focus No. 71). Retrieved from http://www.washingtoninstitute.org/policy-analysis/view/studying-the-american-way-an-assessment-of-american-style-higher-education-, accessed on November 6, 2012. Glain, S. (2009). “Desert Advance”, ASEE Prism, January. http://www.prism-magazine.org/jan09/feature_03.cfm, accessed on November 6, 2012. Gonzalez, G., Karoly, L., Constant, L., Salem, H. and Goldman, C. A. (2008). “Facing Human Capital Challenges of the 21st Century: Education and Labor Market Initiatives in Lebanon, Oman, Qatar, and the United Arab Emirates”, RAND Qatar Policy Institute. www.rand.org/pubs/monographs/MG786/, accessed on November 6, 2012. Green, M. (2010). “Venturing Abroad: US Branch Campuses Overseas”, Proceedings of the CIP Summer Meeting. http://www.aplu.org/NetCommunity/Document. Doc?id=2716, accessed on November 6, 2012. Gulf University for Science and Technology. About GUST. Retrieved from https://www.gust.edu.kw/about-us, accessed on November 6, 2012. Lewin, T. (2008, February 11). “In Oil-Rich Mideast, Shades of the Ivy League”, The New York Times, http://www.nytimes.eom/2008/02/l 1/education/11 global. html?hp, accessed on December 20, 2008. Lewis, M. W. (2010). “What’s in a (Place) Name? The Gulf Controversy”. GulfCurrent. http://geocurrents.info/geopolitics/whats-in-a-place-name-the-gulf-controversy, accessed on November 6, 2012. Lindsey, U. (2010, October 3). “Saudi Arabia’s Education Reforms Emphasize Training for Jobs”, The Chronicle of Higher Education, http://chronicle.com/ article/Saudi-Arabias-Education/124771/, accessed on November 6, 2012. Lindsey, U. (2011, October 10). “Bahrain Cracks Down on Student Protesters with Harsh Sentences”, The Chronicle of Higher Education, http://chronicle.com/article/ Bahrain-Cracks-Down-on-Student/129335/, accessed on November 6, 2012. Maroun, N., Samman, H., Moujaes, C, and Abouchakra, R. Booz Allen Hamilton Inc., Ideation Center. (2008). How to Succeed At Education Reform: The Case for Saudi Arabia and the Broader GCC Region. Retrieved from http://www.boozallen.com/media/file/How_to_Succeed_at_Education_Reform.pdf, accessed on November 6, 2012. Mills, A. (2009, March 6). “Failure of George Mason U.’s Persian Gulf Campus Sparks Concern about Overseas Ventures”, The Chronicle of Higher Education. http://chronicle.com/article/Failure-of-George-Mason-Us/1566, accessed on November 6, 2012. New York University Abu Dhabi.(n.d. ).Frequently Asked Questions. http://nyuad.nyu.edu/about/faq.html, accessed on November 6, 2012. Nordling, L. (2011, October 27). “Gulf Universities Hope for Research Funds”, Nature Publishing Group. http://www.nature.com/news/2011/111027/full/news.2011.617.html, accessed on November 6, 2012. “Oasis in the Desert” (2009, November 5).The Times Higher Education, http://www.timeshighereducation.co.uk/storyasp?storycode=408895, accessed on November 6, 2012. Oleott, D. (2010). “Emerging Opportunities and Challenges for Regional Higher Education, 8–12”. Viewpoints Special Edition: Higher Education and the Middle East: Serving the Knowledge Economy. http://www.mei.edu/Publications/ WebPublications/Viewpoints/ViewpointsArchive/tabid/541/cO, accessed on November 6, 2012. Redfern, B. (2010, November 5). “MEED Education Survey: Standards still Fail to Match Expectations”, MEED, Supplement: Education,http://www.meed.com/supplements/2010/gcc-education-survey/meed-education-survey-standards-still-fail-to-match-expectations/3008116.article,accessed on November 6, 2012. Robison, Gordon. (2005, July). “USC Center on Public Diplomacy — Middle East Media Project, “Education: An American growth industry in the Arab World,http://uscpublicdiplomacy.org/pdfs/Robison_-_Education_An_American_Jul26.pdf, accessed on November 6, 2012. Ross, A. (2011a). “Human Rights, Academic Freedom, and Offshore Academics”, AcademeOnline. http://www.aaup.org/AAUP/pubsres/academe/2011/JF/feat/ ross, accessed on November 6, 2012. Ross, A. (2011b, May 1). “Middle East: Rights, Freedom and Offshore Academics”, Edufactory. http://www.edu-factory.org/wp/rights-freedom-and-off shore-academics/, accessed on November 6, 2012. Ruby, A. (2010, March 21). “Thinking about a Branch Campus? Think Twice”, The Chronicle of Higher Education. http://chronicle.com/article/Thinking-About-a-Branch/64741/, accessed on November 6, 2012. Shediac, R., and Samman, H. Booz and Company Inc., Ideation Center. (2010). Meeting the Employment Challenge in the GCC: The Need for a Holistic Strategy. http://www.booz.com/me/home/what_we_think/40007409/40007869/481411 99, accessed on November 6, 2012. Smith, K. (2012, March 11). “Flying Faculty Teaching — Who Benefits?” University World News, http://www.universityworldnews.com/article.php?story=2012030 7143954219, accessed on November 6, 2012. The Economist Intelligence Unit (2009). The GCC in 2020: Outlook for the Gulf and the Global Economy, http://viewswire.eiu.com/report_dl.asp?mode=fi&fi=l 74383002.PDF&rf=0, accessed on November 6, 2012. The Economist Intelligence Unit (2010). The GCC in 2020: Broadening the Economy. http://graphics.eiu.com/upload/eb/AVIVA_%20GCC_to_2020_ Economic_diversification_in_GCC_WEB.pdf, accessed on November 6, 2012. The World Bank (2007). “The Road Not Traveled: Education Reform in the Middle East and North Africa”, MENA Education Flagship Report. http://siteresources.worldbank.org/INTMENA/Resources/, accessed on November 6, 2012. Thomas, K. (2010, November 5). “Knowledge Hubs Grow in Number in the Middle East”, MEED, Supplement: Executive Education Guide, http://www.meed.com/supplements/2010/executive-education-guide/knowledge-hubs-grow-in-numbers-in-the-middle-east/3077499.article, accessed on November 6, 2012. Toumi, H. (2008, October 29). “Council Warns Bahrain Universities”, Gulf News. http://gulfnews.com/news/gulf/bahrain/council-warns-bahrain-universities-1.139189, accessed on November 6, 2012. UNESCO (2009). EFA Global Monitoring Report, http://unesdoc.unesco.org/ images/0017/001776/177683e.pdf, accessed on November 6, 2012. United Nations Development Programme (2003). “Arab Human Development Report: Building a Knowledge Society”, New York: United Nations Publications. http://hdr.undp.org/en/repo rts/regionalreports/arabstates/name,3204,en.html, accessed on November 6, 2012. Vaidya, S. K. (2010, October 26). “Leading Bank Offers Higher Education Savings Plan”, Gulf News, http://gulfnews.com/news/gulf/oman/leading-bank-offers-higher-education-savings-plan-1.701640, accessed on November 6, 2012. Wheeler, D. L. (2011, April 17). “Lecturer’s Anest in the Emirates Stirs Debate Over Academic Freedom in the Middle East”, The Chronicle of Higher Education. http://chronicle.com/article/Lecturers-Arrest-in-the/127190/, accessed on November 6, 2012.